Best Flexible Molds - About the designer! There is a lot of work involved after picking the theme for a mold. Sizes, how many parts in the mold, how to lay out the parts for easy de-molding, etc. The Woodland Spirit mold came about after I sculpted two leafy lady designs, one large and one small, for a challenge. It was a great deal of work and the quiet feeling of the pieces inspired some designs to go with it. They had to be modified to work as molded parts. After modifications, they were laid out in the mold size diagram and sketches were drawn to fit more woodsy designs into the mold with them. We try to get as many parts in a mold as possible. The two "Carved" wood spirits were sculpted as old men with beards and wise faces. The owl just seemed to be a good choice to go with the group. The little knot hole can be a bead. Mold two of them and place them back to back on a bead pin or wire. Press gently to bond and bake and you've got a bead that is a knot hole. Each of our molds come with instructions to make a project from a molded part. This one is no different. Clay buddy Jane and I worked out this beaded brooch. It is simple but very showy. The colors are mica powders but acrylic paint could be dry brushed onto the baked part before antiquing the piece with burnt umber acrylic paint. About Penni Jo and Joe Couch and their original designs. The original molds were hand cast in Maysville, Oklahoma for polymer clay, metal clay, plaster, craft soap wax, and UTEE. Until they retired and passed the business to Poly Clay Play, Joe and Penni Jo worked together to create hand cast Urethane Rubber polymer clay molds and mats from her original designs and sculpts. Glued to a smooth ceramic tile in a layout that will fit the mold maker form. Joe takes the parts on the tile and casts the master (initial) mold using our tough, urethane rubber. This first mold is perfected and glued to a tile where a mold making mold rubber mold is cast over it. Next several molds are cast of urethane rubber using the mold maker mold. Three molds are glued to a board to make a gang mold which is cast in silicone rubber. The gang mold allows us to cast three urethane rubber molds at a time. After de-molding the parts from the gang mold, they are trimmed and prepared for packaging. We take all the photos for the color sheets and write the instructions for the package inserts. The finished molds are packaged and stored, ready to ship. Joe does do all the handling and shipping. Best Flexible Molds is a genuine Mom and Pop company. In 1981 I attended a miniature meeting with a lady from church. At one of the meetings I found a wonderful new clay called Fimo with which I immediately fell in love. From '81 through '89 I had a little business, making and selling doll house miniatures made of Fimo including doll house dolls. I designed and taught a number of classes using Fimo in Oklahoma and at miniature conventions throughout the country. I learned how to make porcelain molds and began to make and fire porcelain miniatures from original Fimo sculptures. In addition to the lines that I designed, the company produced a limited edition line of my signature pieces PenniBears (image left Bountiful Harvest 1/25" tall). After United Design was sold to a large corporation, I left the company in 04. I started a design company based in my home where I worked as a designer for a number of companies in the US, Canada, Philippines and China. 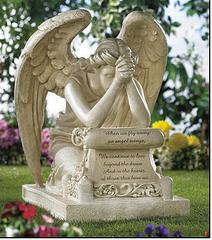 I designed and art directed this grieving angel, left, for Autom's Gifts of Faith. In February of 2008, I retired from the gift ware industry. Today I still play in clay, paint a bit and plan and teach classes both in the Oklahoma City area and at events out of town. One of the projects that has intrigued me is the inro, a wearable vessel that is both functional and beautiful. I made this unique inro in Magic River Mississippi on a trip to St. Augustine Fl. where I taught Faux Jade Inro with molded designs at the Fandango Retreat. To read more about this trip, check out my blog. Currently we are making and marketing original, flexible push molds and texture mats here at our home base. Our business gives me many opportunities to design, teach, and sculpt. Owner, Operator of Penni Jo's Originals Ltd. 7 years. Creator and Sculptor of the charming PenniBear Line for 11 years. Owner operator of Penni Jo's Design Group, Inc. 4 years. 2005 Started our little mold company Best Flexible Molds from original sculpts. 2011 Started the OK Poly-Clay Twister Retreat in April with a one day retreat in my home. 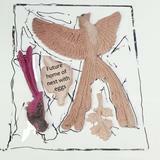 2012 OK Poly-Clay Twister Retreat – April – guest artist Christi Friesen, 3 day event. 2012 Sandy Camp – Selected to be a demonstrator. 2013 OK Poly-Clay Twister Retreat – April – guest artist Syndee Holt,, 3 day event. 2013 Fandango – Eagle feather cane workshop & retreat demonstrator. 2015 Taught and demonstrated Orlando Clay Fandango. Published in magazines: The Polymer Arts, Bead Unique and twice in Polymer Cafe. I am a co-founder of the Ok Poly-Clay Twister annual Retreats.